Posted by Jill S. Schneiderman in "Eaarth", Buddhist concepts, earth community, satellite images. 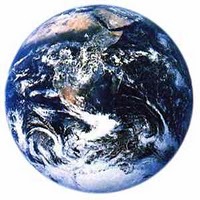 Whether is it ‘our Earth’ or not, I certainly agree with James Coffin, member of the executive committee of the Interfaith Council of Central Florida, that we humans have a spiritual obligation to care for it. You can read Coffin’s informative opinion piece here.